For years, both doctors and nutritionists were continually preaching that low-fat diets were the way to not only lose weight, but to save the generations from things like heart disease and high cholesterol. Fat in the 1980’s and 1990’s was the enemy. Fat free sour cream, fat free crackers and cookies, fat free ice cream…everything became fat free. Now we are learning through the studies and research of men like Dr. David Perlmutter, MD, author of the new book, Brain Maker, that all fats are not created equal. “One of the myths I’m always trying to dispel is that fat is unhealthy. Most people think those high-fat foods are the reason their pants are fitting a little tighter.” He says in his article Exposing the Secret of Healthy Fats. He goes on to share that it’s less about the quantity of fat and more about the type. Nope! In sharing this with my clients, I immediately get some strange looks and questions… “You want me to eat more fat? Are you sure?” and I answer with a resounding “YES!” This is one of the main reasons that our American Society is overweight and by allot! According to the Center for Disease Control, one-third (34.9% or 78.6 million) of US adults are obese compared to 1970, before the fat free craze began, when only 11.7% of adults were overweight. That’s a big jump and it all started with the overly processed, fat-free fever. Most foods contain several different kinds of fats, and some are better for your health than others. So how do you weed through years of information and get down to the source of health? Don’t worry…I’ve done it for you! Here’s a look at the different types of fat, their effects and the healthy fat choices you should be making. Trans Fat: This type of fat rarely occurs in natural foods and if so, in very small amounts. Most trans fats are made from oils through processed foods through a method called “partial hydrogenation”. By partially hydrogenating oils, they become easier to cook with and less likely to spoil in your pantry. Studies show that an increase in trans fat increases unhealthy LDL cholesterol (bad cholesterol) and lowers HDL (good cholesterol). This unhealthy concoction can drastically increase your risk of cardiovascular disease, overall cholesterol levels and your risk for Type 2 Diabetes. What to Look Out for: Processed Foods sold at room temperature usually contain the most saturated and trans fats due to the lack of spoilage. But be aware, these unhealthy fats are stored all over the grocery store. Try to avoid or limit things like potato chips, French fries (frozen section), snack cakes or pies (sorry Little Debbie), shortening, crackers, cake mixes and frostings, pancake and waffle mixes, chicken nuggets (frozen section), certain flavors of Haagen-Dazs ice cream, non-dairy creamers, microwave popcorn, high fat yielding meats, cookies, jerky or meat sticks, canned chili and packaged pudding. These tend to have the highest levels of trans fats. Instead Opt for foods that are as unprocessed as possible. Homemade baked goods using coconut oil instead of canola oil or shortening. Air popped popcorn with a little grass-fed butter and sea salt. Baked Veggie Chips or one of my favorite Black Bean Chips, Beanitos. Homemade Ice Creams or Puddings. Grass-Fed Butter in moderation instead of margarine. Goat cheese instead of cheddar. Part Skim Mozzarella instead of processed nacho cheese. There are alternatives to almost everything! Check out our Recipe section for more ideas! Saturated Fat: This type of fat comes mainly from animal sources such as red meat, poultry and full-fat dairy products. Now before you run to the fridge and freezer and start chucking your steaks and butter, let’s take a closer look. Saturated fats, when paired with a high carbohydrate diet, raises total blood cholesterol levels and LDL, which are your low-density lipoprotein levels. This can increase your risk of cardiovascular disease. The Saturated fat & high carb combo may also increase your risk of Type 2 Diabetes by increasing the fat storage in the liver and around the intestine, impairing insulin action. Now, that being said, there is a balance needed to a meat-eating diet. 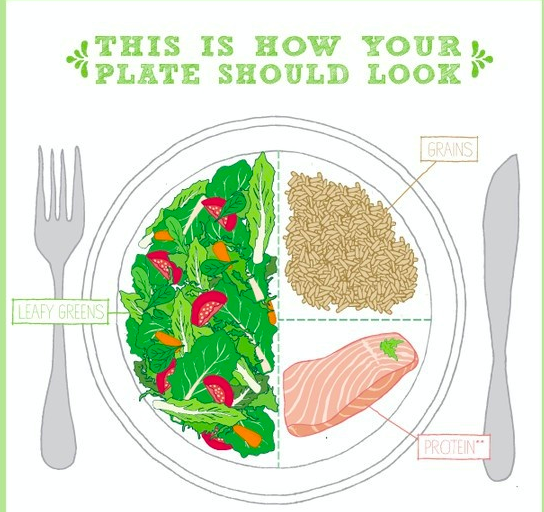 When looking at our healthy plate, here is the breakdown. A Healthy plate should contain one-fourth protein, another half vegetables and the remaining one-fourth grains is an important ratio when trying to control your health risks for diabetes and cardiovascular disease as well as your waste line. Choose cuts of meat that provide a great amount of protein, flavor and have low levels of saturated fat and eat them in the right proportions. These are lean cut meats like chicken breasts, beef round roasts, sirloin steaks, salmon or halibut, turkey breast and pork tenderloin. Remember before cooking to remove any unnecessary animal fat. We all know fat means flavor, so add a couple teaspoons of a healthy fat like olive oil to meat before sautéing or grilling! Replace the bad with good! These types of fats are mostly unsaturated and are a critical need for our bodies. 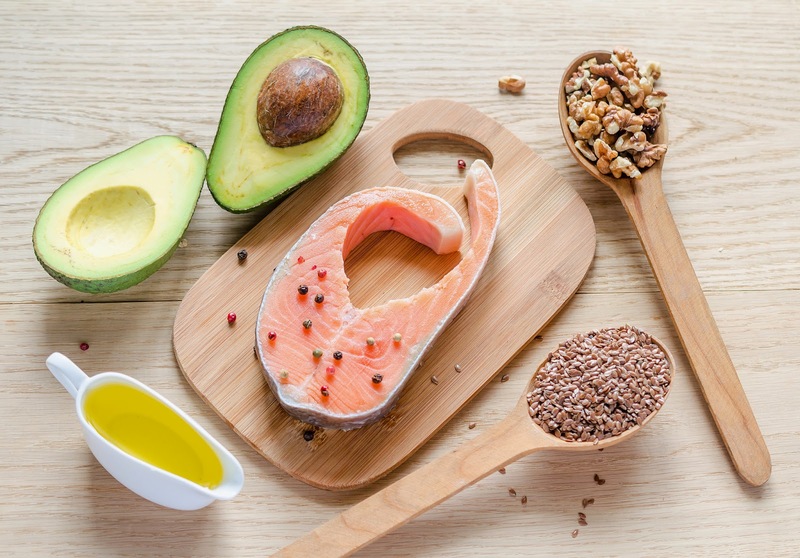 As Dr. Perlmutter says, “The body needs a balance of two types of essential fats: anti-inflammatory omega-3’s and pro-inflammatory omega-6’s. This balance needs to be closer to a 1:1 or 2:1 ratio to ward of diseases like diabetes, arthritis, heart disease and cancer. But due to our American diets of a 20:1 ratio….we are simply unbalanced. Monounsaturated Fat: We’ll call these MUFA’s. They improve blood cholesterol levels decreasing your risk for heart disease while benefiting insulin levels and blood sugar control! Polyunsaturated Fat: Found mostly in plant-based foods and oils, we’ll call PUFA’s, also improves cholesterol and blood sugar levels! Omega-3 Fatty Acids: These fatty acids are in direct relation to the health of your heart, so not only are they lowering cholesterol, but they are decreasing your risk of coronary artery disease. Say goodbye to early heart attacks with Omega-3’s! These fats also protect against irregular heartbeats and lower blood pressure. The best foods to increase your Omega-3 intake are fish! I’m not much of a fish lover, so I can understand the disappointment when I tell my clients to cut back on the bacon and add fish to their diet, but I have found some really yummy ways to help you enjoy fish a couple times a week. Check them out here! Healthier Fats can be found in olive oil, safflower oil, salmon, tuna, trout, mackerel, sardines and herring. Also flaxseeds, flax oil, coconut oil, avocados, nuts and other seeds like sunflowers and walnuts are super healthy for your heart! Nice information about Dietary fats.Thanks for sharing.